Iron is used to make hemoglobin, a molecule in red blood cells that has a pretty important purpose: moving oxygen throughout the body. Hemoglobin is also what makes red blood cells red. So, when there’s not enough iron in the body, there’s not enough hemoglobin (and thus, not enough oxygen). This makes red blood cells pale and small, resulting in iron-deficiency anemia. This condition often causes fatigue and weakness. Babies need iron for their brains to develop normally, too. Iron plays an especially significant role in brain development during three stages of life: pregnancy, toddlerhood, and adolescence. Research indicates that iron deficiency in infancy can result in longer term issues. 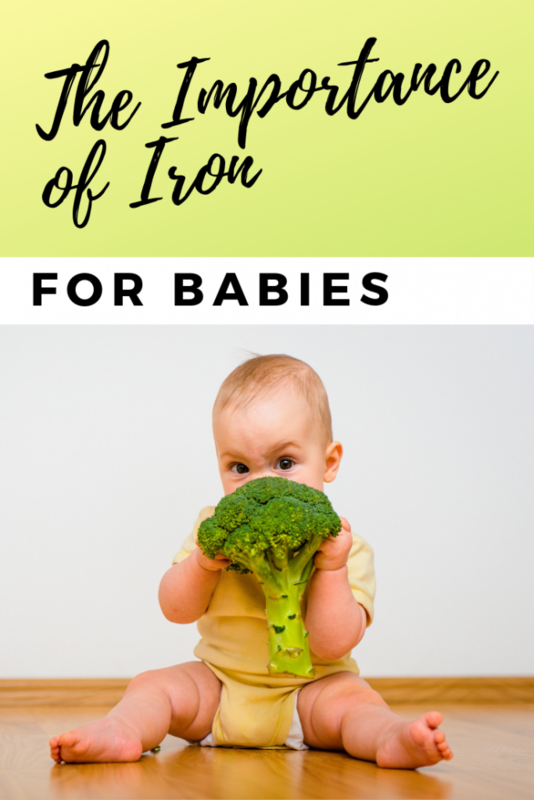 So, it’s a good idea to set infants up to maintain adequate iron stores throughout all stages of childhood. As iron-deficient kids get older, they may continue to develop more slowly and have difficulty concentrating, have a shorter attention span, and have trouble in school. Babies are born with an iron reserve. They can thank us for that, because they got it from their mama! This of course also means it’s important for mamas to maintain a healthy iron status throughout pregnancy. For the first six months of life, babies will get all of the iron they need from breastmilk or iron-fortified infant formula. What happens after six months? 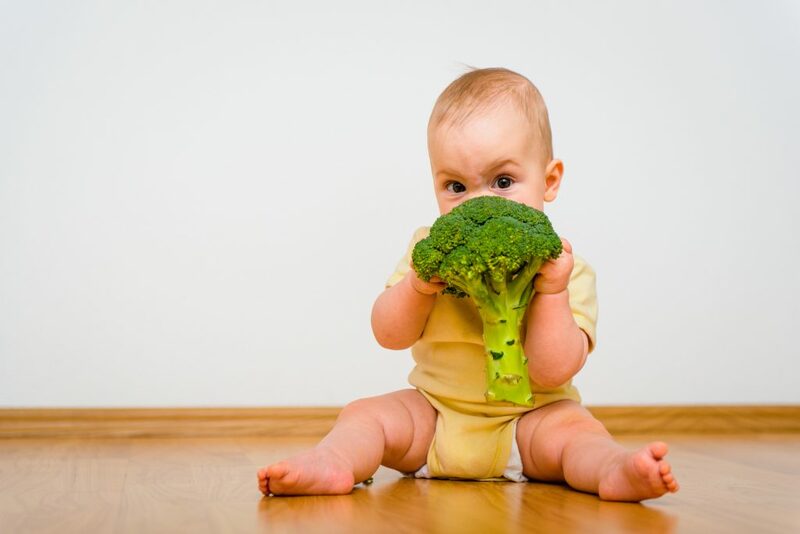 By this time, many babies have already started (or will soon be starting) to eat some solid foods. Between breast milk, infant formula, and iron-rich foods, babies can continue to meet their iron needs as they begin to wean. Now that we know how much iron babies need, what does that look like in terms of food? Below are some great iron-rich foods for babies, which can be prepared in various ways to make sure they’re age appropriate. Iron is super important. Fortunately, it’s also easy to find on a plant-based diet. Incorporate some of the ideas above into your babe’s routine and let him or her decide which ones are the most yummy. And if you’re ever concerned about your PBJ’s iron status, bring it up with your pediatrician or registered dietitian. This is super helpful, but also seems hard to get to 11mg a day without giving them oatmeal everyday. Any suggestions for a 7 month old? We’re doing to meals of solids a day and breastfeed. It definitely IS hard to meet this high recommendation (whether or not your baby is plant-based), especially if you’re exclusively breastfeeding. I provide my son Caleb with fortified baby oatmeal every morning in addition to other offerings as one way to try to hit this high amount. The AAP actually recommends that exclusively breastfed infants be provided with 1 mg/kg of iron per day from 4-6 months before they begin to get enough in their diet. If you don’t feel you’re able to meet your babe’s needs, talk to your pediatrician about supplementing.